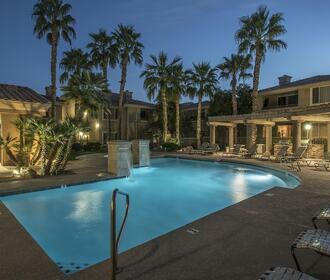 Recognized as one of the best places to live in America, lies the Phoenix district of Ahwatukee. Ahwahtukee sits near the picturesque slopes of South Mountain and is surrounded by a vast desert of magnificent flowers, towering cacti and sparkling ponds. 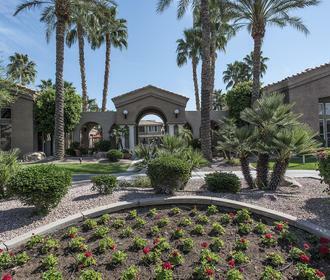 At the tranquil community of San Paulo you will discover modern apartments with distinct features, encompassed by remarkable amenities and an intimate Phoenix, AZ setting. According to local lore, “Ahwatukee” translates to “house of dreams,” which is the perfect depiction for these homes at San Paulo. Lavish touches abound throughout each apartment, including decorative crown molding, elegant Roman tubs and custom cabinetry. Expansive walk-in closets, a full-size washer and dryer set and a storage area on the patio or balcony make each space as convenient as it is comfortable. In select models, wood-burning fireplaces, marble vanities and overhead plant shelves enhance the luxurious appeal. Outside, explore the impressive amenities such as a sparkling swimming pool and hydrotherapy spa, a state-of-the-art fitness center, and with gas and charcoal grills for outdoor entertaining. San Paulo is located in close proximity to pristine golf courses, several shopping centers and restaurants, and countless recreational attractions. 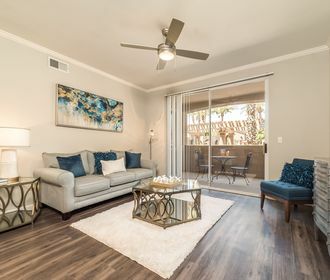 Find your Phoenix dream home when you lease an apartment at San Paulo.